Joseph P. Ganim approaches Henry Jemison for a signature. On a brick sidewalk along Park Street in Hartford, Henry Jemison was railing Thursday about the stupidity of corrupt politicians, potentially an awkward encounter for Bridgeport Mayor Joseph P. Ganim. But no, Jemison was talking about Eddie A. Perez, who never went to prison. And not Ganim, who did. Perez was Hartford’s mayor when a city contractor installed the Park Street pavers, part of an $8 million streetscape project that went over budget. Around the same time, the contractor’s company did $40,000 in kitchen and bath improvements at Perez’s home. In his time, according to testimony at his trial in 2003, Ganim took $500,000 in kickbacks from city contractors. He was sentenced to nine years and served seven. Jemison, 51, a wiry man with close-cropped dark hair and a salt-and-pepper beard, also had unkind words for John G. Rowland, the twice imprisoned former governor of Connecticut. But Joe Ganim, he was alright. Ganim did his time. Bridgeport voters saw fit to return him to office. And now he’s on Park Street, standing on a sidewalk that was evidence in another mayor’s bribery case, asking Henry Jemison to help him run for governor. Ganim fell short at the Democratic state convention last weekend in a two-way contest for the gubernatorial endorsement with Ned Lamont, a wealthy Greenwich businessman. Needing 15 percent of the vote to qualify for a primary in August, Ganim got 12.7 percent. His alternative route is collecting signatures from 2 percent of registered Democrats. Henry Jemison signs Ganim’s petition. “Print you name here,” Ganim said, holding a clipboard. Every signature has to be submitted for authentication to the registrar of voters in the city where the voter resides. He expects about one of every four to be rejected. Addresses will turn out be wrong. Some voters will turn out to be unaffiliated. Ganim laughed. That information is not required. Dukes explained she was working for Joe Ganim, and a signature would help him get on the ballot. Dukes turned to Ignacio Viera Fuentes, sitting in the shade of a tree on a three-wheeled, candy apple red motorcycle. He shook his head. “I’m a criminal,” he said. Back in the day, Fuentes said, he ran with the Savage Nomads, doing battle with the Ghetto Brothers. He said he is an Army veteran who left the life a long time ago, tired of doing time and disappointing his mother. He also was slowed by a collision up the block with a beer truck. It cost him a leg. Fuentes said he never has voted. 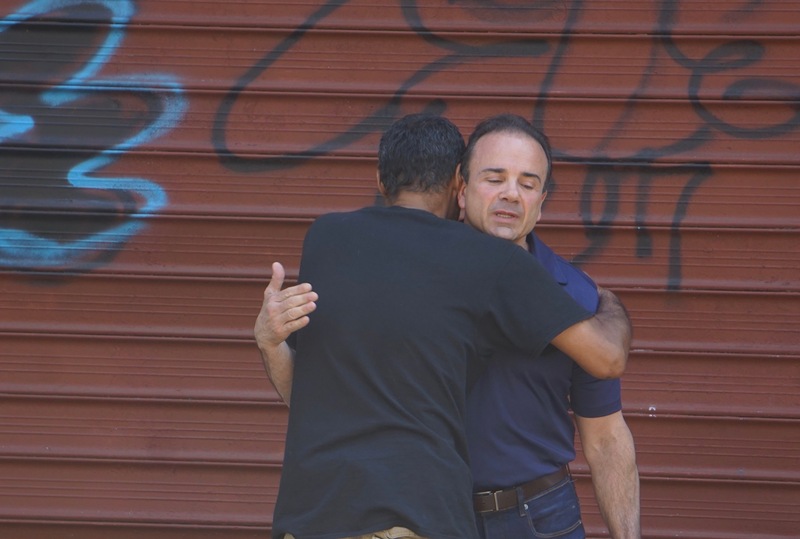 Ganim moved up the block, encountering a young man wearing a T-shirt bearing the image of a machine gun. Ganim was in jeans and blue golf shirt with a “Ganim 18” logo. The young man pushed a double stroller carrying two girls. He was unsure if he could sign. He, too, had a criminal record. “Are you off paper?” Ganim asked. “Not no more,” he replied. “As long as you voted in the last election,” Ganim told him. The man signed, then posed for a photo with the mayor. They shook hands and parted company. Mojica shook his head. He wasn’t interested in what Ganim was selling. 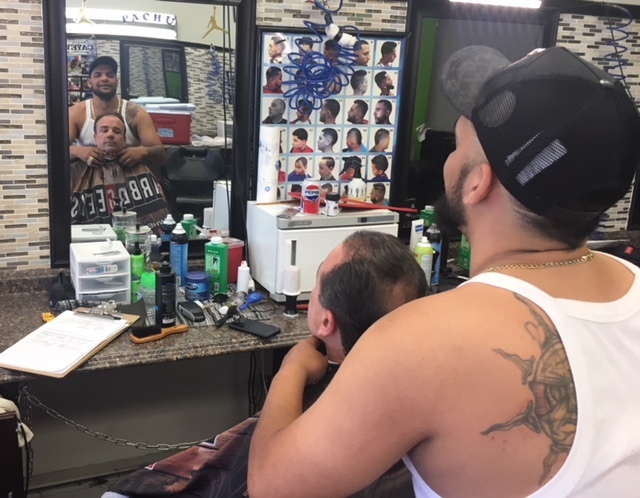 Ganim walked into the shop, followed by Fredo Castillo, a Bridgeport city councilman who retired on a disability from the Bridgeport Housing Authority after falling off a ladder. “Forty feet,” he said. Castillo speaks Spanish, backing up the mayor on campaign forays in Latino neighborhoods. Ganim got a haircut and a signature form Felix Mojica. In the shop, music blared, a reggae beat, Spanish lyrics. Mojica gestured to his chair. “You want to tighten me up?” Ganim said, gesturing to his dark hair. Ganim sat, and Mojica went to work with clippers, then a straight razor. A Dominican flag hung on the wall, but it turned out Mojica was from Puerto Rico and a U.S. citizen whose signature could help Ganim. Raquel Calderon, a Spanish-speaking volunteer who was a delegate from Harford, joined him. She said she believed Ganim understood the struggles of people in a neighborhood like Park Street. He knows what it’s like to come home from prison. “I don’t think Mr. Lamont would understand that,” she said. Ganim insists he is a credible candidate, an opinion shared by only 12.7 percent of the nearly 2,000 delegates to the Democratic convention, 90 of whom were from Bridgeport. He has political gifts, an easy way with people who don’t often find a gubernatorial candidate on their stoop or in their barber shop. The Republicans wish him every success in the Democratic primary. 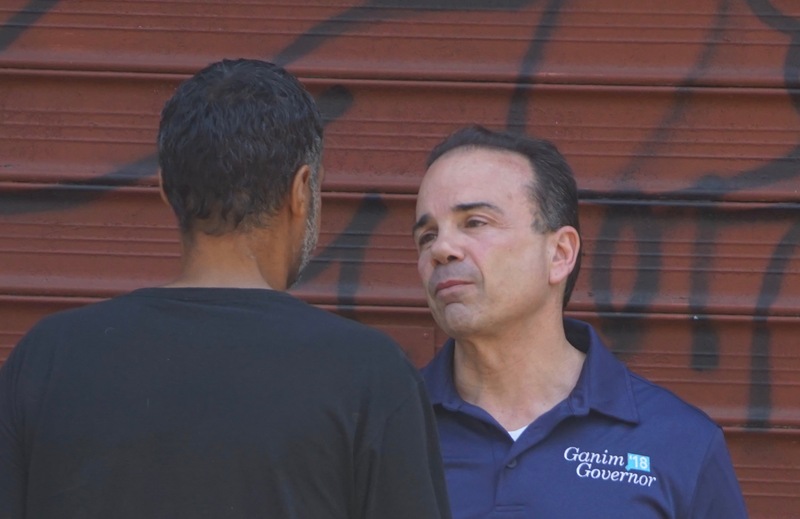 On Saturday, Ganim will go to Greenwich, not to door knock on Lamont’s street. His destination is an affordable housing complex, where his staff says there are Democrats, some black and Latino. 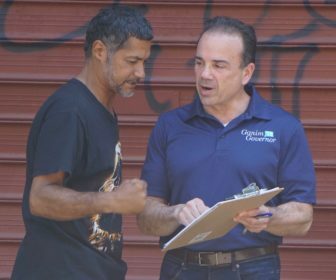 Ganim left Nuestra Casa with a small group of volunteers. He looked to the next apartment building, bigger than the last. Ganim was off, moving, always moving. He was heading north on Oak Street, towards Capitol Avenue. He didn’t notice, but if he stopped long enough to look, peeking out over the roofs of subsidized apartments was the gold dome of the State Capitol.